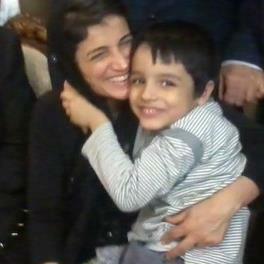 There were many people today who were overjoyed with the news of jailed Iranian Human Rights lawyer, Nasrin Sotoudeh having been granted a three day leave from Evin prison, and this picture of Nasrin Sotoudeh with her son, Nima, topped it all. A moment of sheer joy worth a million words that both the mother and child are dearly clinging on to and hoping it would never end. The picture reminded me of a Persian poem I had to recite in front of the whole school in Iran on Mother's Day. I was barely nine years old and two things worried me most on that day; the natural fear of forgetting the verses while standing up in front of the whole school and even a greater concern about how a class mate of mine, who had lost his mother, would feel when he heard the words. At the end, the whole enormity of the occasion engraved the verses of the poetry in my mind forever. As usual when translating Persian poetry, all I can say is, it never sounds as good as the original, its the best I can do. It is so unfair that they have been separated in the first place and have to be satisfied with a few minutes of reunion. Excellent post i really like your post.Mothers are the sweetest gift from Gods to us. There is no way we can ever really thank our mother .